In the previous parts of this series the infrared-to-Android gateway based on the RFDuino hardware and an improved version of the hardware were presented. The improved hardware offered quite reliable IR code recognition even when the BLE connection was in operation. Trouble with that implementation was the polling nature of the code; even though the IR reader support hardware is capable of raising an interrupt when a new time measurement is available, the code did not handle that interrupt, instead it polled the interrupt signal. Click here for the updated gateway code. Click here for the (unchanged) Android application serving the gateway. The reason I did not implement proper interrupt handling was the I2C library (called "Wire") coming with the RFDuino. 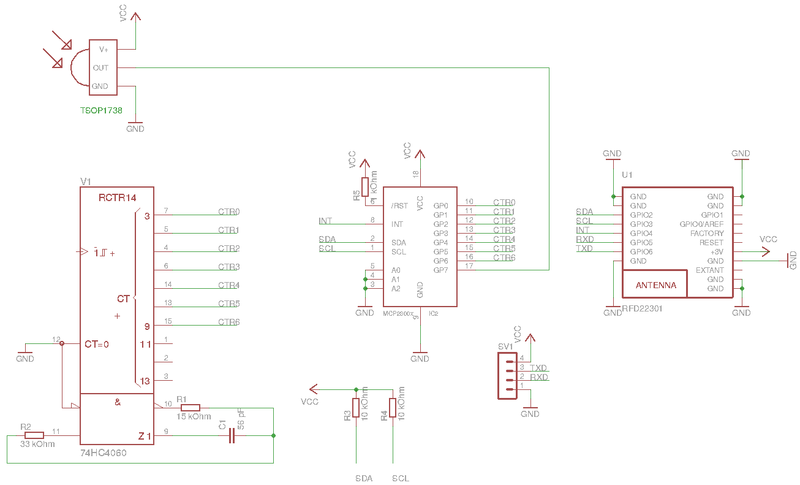 Even though the nRF51822 (on which the RFDuino is based) is able to handle its I2C interface (called TWI, two-wire interface) by means of interrupts, it was not implemented in the "Wire" library. When the MCP23008 GPIO port extender raised an interrupt, the MCU was expected to read the MCP23008's capture register by means of an I2C transaction. As the "Wire" library was polling-based, this transaction held back the GPIO-handling interrupt for too long time, freezing the system. The solution was transforming the "Wire" library into interrupt-based implementation. Now as my goal was a limited functionality (reading one register of an I2C periphery) I did not do it properly. I moved the entire "Wire" library into the application project (see it under the "lib" directory), renamed it to "Wire2" and introduced a couple of new methods, more importantly sendReceiveInt (in lib/Wire2.cpp). This method initiates the write transaction of a data array followed by a read transaction of another data array over I2C, all handled by TWI interrupts. This means that sendReceiveInt returns immediately and the actual data transfer happens in the background. This new method is invoked in the GPIO interrupt handler (GPIOTE_Interrupt in sketch/irblegw3.ino) but this time the GPIO interrupt handler completes very quickly as its job is only to initiate the TWI transaction handler. When the TWI transaction is finished, the TWI interrupt handler invokes the onReceive callback that ends in the application code (twi_complete in sketch/irblegw3.ino). The most important outcome of this - quite significant - change is that the MCU does not spend its time spinning on the GPIO port reading loop. Instead, it waits for interrupts in ultra-low power mode (sketch/irblegw3.ino, IRrecvRFDuinoPCI::GetResults method, RFduino_ULPDelay invocation) which is important if the infrared-to-Android gateway is powered by a battery. As you may have guessed, my goal is not to fiddle with IR remote controllers, I intend to build a short-range network comprising of infrared, BLE and cellular links and the infrared-to-BLE gateway was just one step. 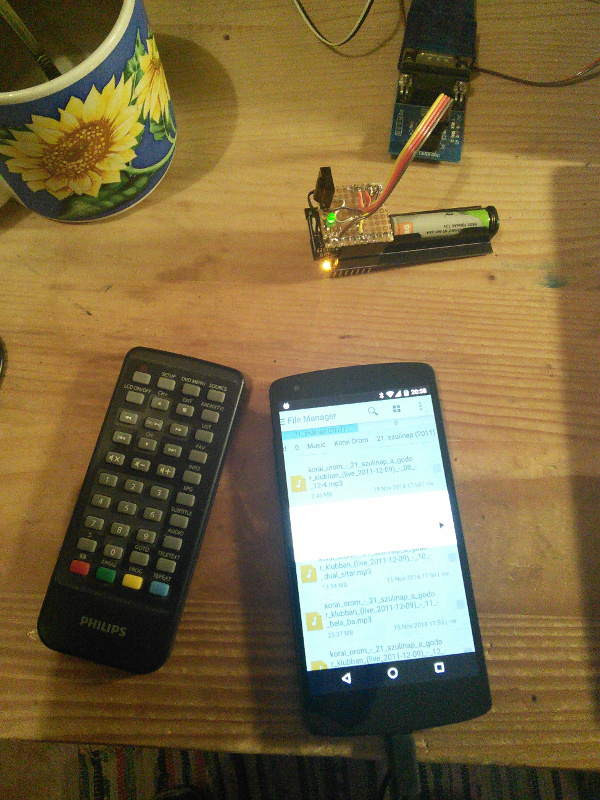 I came across several posts about microcontrollers decoding signals of infrared remote controllers and started to think, how an IR remote can be integrated with an Android smartphone. 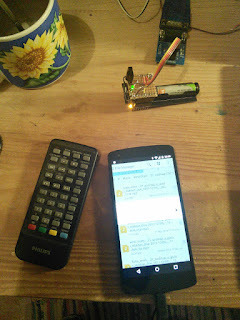 This post is about a simple use case when I control the media volume of the Android phone with an IR remote. Long time ago, in a distant galaxy, IR transmitter-receiver was a standard feature of almost any mobile phone. Technological progress has eliminated that feature so we are now forced to build some hardware. We need infrared sensor for sure to capture the remote's infrared signal. But how can we connect that to the phone? Last year's experiments prompted me to choose Bluetooth Low Energy (BLE). Also, the microcontroller platform was determined by my experiences with RFDuino and I happened to have an RFDuino set in my drawer. The idea is the following. 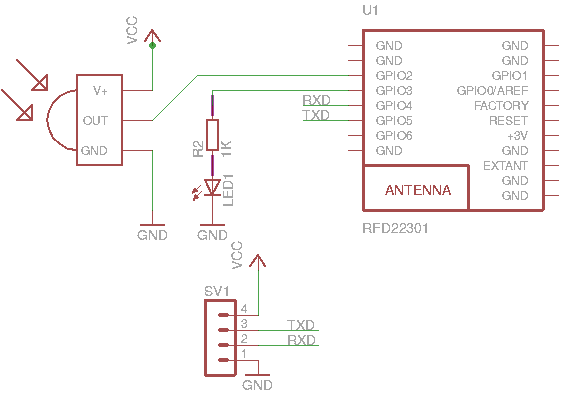 An infrared receiver is connected to the microcontroller that captures and interprets the infrared signals. If the phone is connected to the BLE radio, then the key codes sent by the IR remote are then sent to the phone over BLE. The phone does whatever it wants with the key codes, in my example the volume up, down and mute buttons are handled and are used to influence the volume of the music played by the media player. The infrared implementation is based on the excellent IRLib code. IRLib assumes that the IR receiver is connected to one pin of the microcontroller so I built the circuit below. 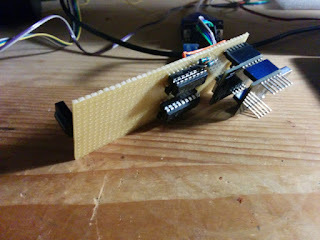 A TSOP1738 IR receiver is directly connected to a GPIO pin of the RFDuino which is expected to do all the decoding. SV1 header is only for monitoring debug messages, it is not crucial for the operation of the gateway. If you intend to use it, connect an RS232C level converter similar to this one. Then came the complications. "Arduino code" is used with great liberty on the internet, as if Arduino meant a single platform. But in reality, Arduino is a very thin layer on top of the underlying microcontroller. Most of the code, tools and articles out there are based on Atmel's extremely popular AVR family of MCUs. These are 8-bit CPUs, equipped with a host of peripherials. The challenger in this domain is not Intel but ARM's Cortex family. RFDuino is a Nordic Semiconductor's nRF51822 System-on-Chip (SoC) which is a Cortex-M0 core with integrated 2.4 GHz radio. BLE is supported by means of a software stack. ARM Cortex is not supported as well as AVRs by the Arduino community and this miniproject is a cautionary tale about this fact. Click here to download the RFDuino project. In order to compile it, you need to install the Arduino IDE with the RFDuino support as described here. Adapt this according to the layout of your file system. Then type "make" and the entire code should compile. "make upload" uploads the compiled code into the RFDuino, provided that the port (AVRDUDE_COM_OPTS = /dev/ttyUSB0 in the Makefile) is also correct. And now the biggest surprise. If BLE is not active, all the three implementations work. But if BLE is active, the software stack running behind the scenes on the RFDuino steals enough cycles so that IR reading becomes completely unreliable. The best result is provided by IRrecvRFDuinoPCI (which is activated in the download version) but even that version, after a significant loosening of the matching rules drops about 1 IR key out of 4. Well, folks, that's what I could achieve with this hardware and that's the second important take-away: SoCs with integrated communication stacks (this time BLE, but can be WiFi, GSM, whatever) are notoriously tricky if the sensor processing logic is time-critical. Click here to download the Android code. 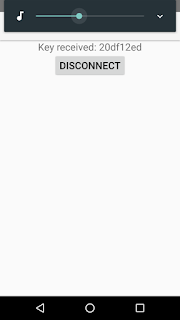 To decrease download size, I packed only the files under the app/src/main directory of the Android Studio project. This is the fragment that maps IR remote keys to actions on the phone. 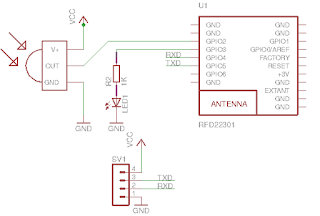 The RFDuino-based gateway does not do any key mapping so it is the Android application that needs to know the meaning of the IR key codes. The following comes from the Philips remote I grabbed for these experiments. It is highly likely that you will have to change this value according to your remote's key code map. Just press the desired button and check the code. This project was not a complete success as IR reading is not as reliable as it should be. But it is indeed fun to control the Android phone with an ordinary IR remote. I plan to improve the hardware a bit to make key recognition better so stay tuned (if you care about IR remotes). Update: check out the follow-up blog posts (this and this).